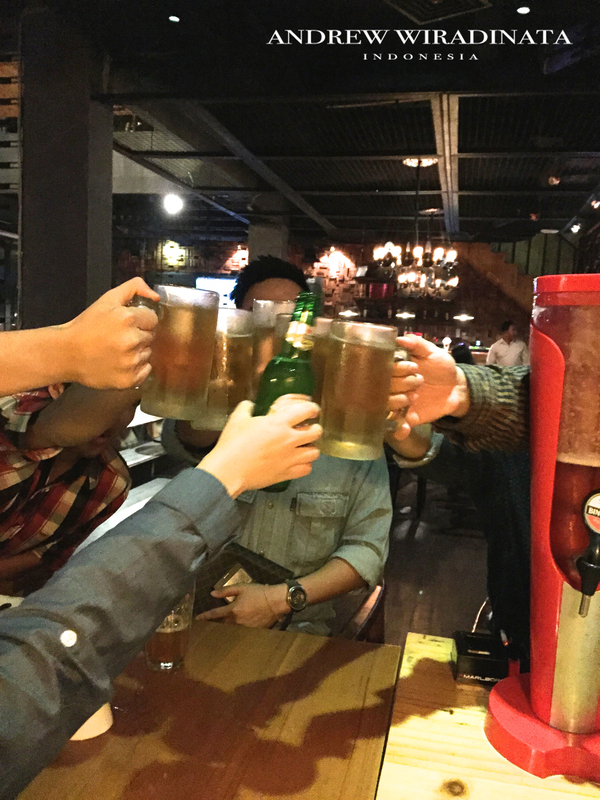 After 3 weeks of not posting anything, I come up with the review of Port er House which is located at Ruko Crown Golf, Blok B No. 38-39, Bukit Golf Mediterania, Jl. Marina Indah Raya, Pantai Indah Kapuk, Jakarta. Yea, I know, I’m a century late for reviewing this place. But since this was my first time, I will still review it. Basically, Port er House is a cafe. Back then, this cafe was a hip place where hundreds of boys and girls hanging out on Saturday night. Lately, It’s not that packed anymore. Some of you might have an perfect answer for this. The interior design was quite good, the investors surely put down some investments to create this kind of interior design. The place was divided into 2 sectors, Outdoor and Indoor. They have this cage-like seat that’s like hanging but it’s not, there was also some seats with lower table if you guys just want to drink not to dine, there was also regular rounded tables. The outdoor sector is a great place to sit and still get some fresh air. The indoor part was divided again into 2 parts, one with long table, and the other was a platform with lower desks and seats. Me and my friends came by on friday evening hence I could see what the place was like at the evening. It was outrageously dim at one place and bright at the other, my photos are all edited to look much brighter. Honestly, i disliked it. And for one other thing, if you or your friends are smokers then feel free to smoke indoor too. We ordered some food and drinks. First, we ordered a Porterhouse Salad (38K). From the price point, it’s quite inexpensive. 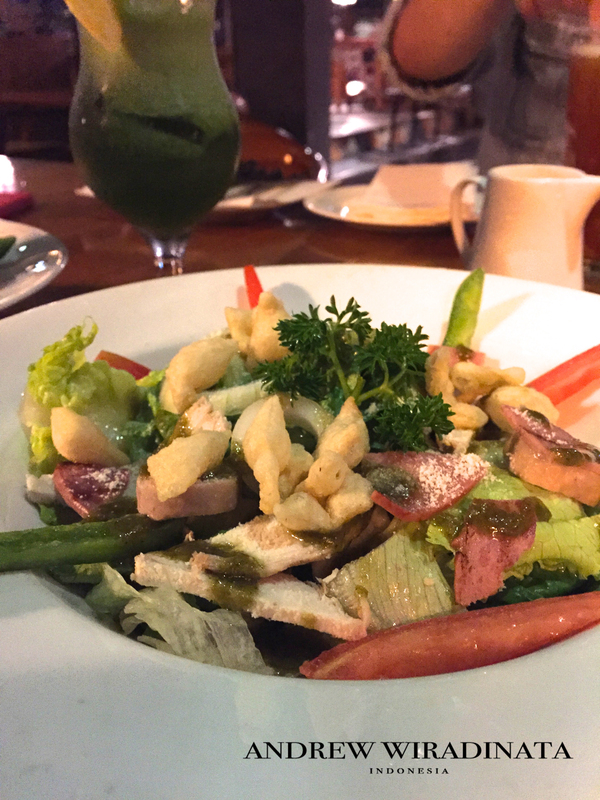 From my friend’s opinion, the salad was just okay, nothing special. 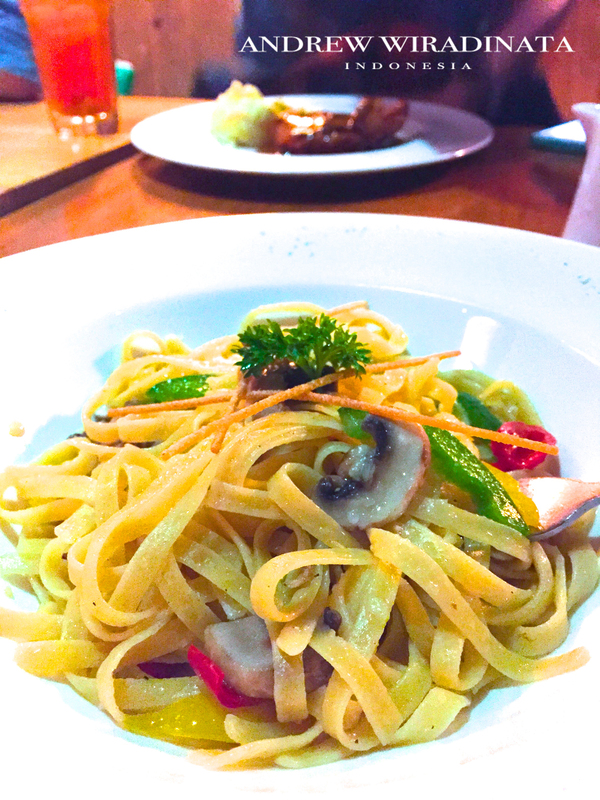 We also ordered a plate of Fettuccine Cilantro Chicken (60K). My friend had a hard time swallowing even though he was starving. Poor him. 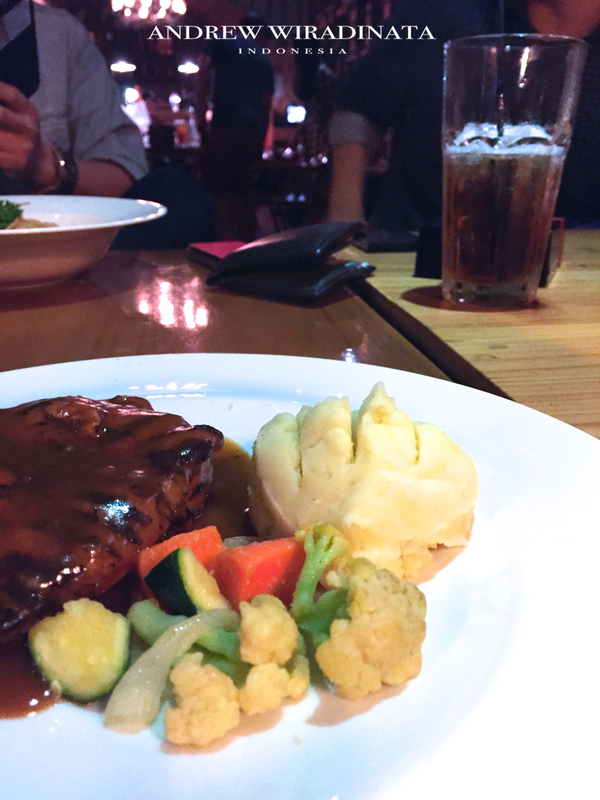 The next thing was Porterhouse Grilled BBQ Chicken (60K). It only consisted of chicken breast, mash potato, and a little portion of vegetables. I realized it really wasn’t a beautiful thing to shoot. Actually, the taste was not bad, it’s just okay. My friend said the Special Indonesian Fried Rice was the better choice for you guys who wants to dine here. It’s not a great experience. I won’t comeback there to dine, but only to have some drinks. All photos were taken by my phone so please mind the blurriness. You could follow my Instagram @raid_insecret for better pictures.